Superman #1: What Price Tomorrow? 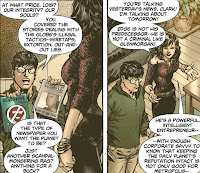 Superman (2011) #1: What Price Tomorrow? There's some kind of alien sending a signal out into space, and then an alien shows up at the Aerodrome? That's not a coincidence, although you always have to ask what they want there. Unless I'm missing some specific piece of backstory, an Astrodome is a stadium right? Or an aptly named super-planetarium. I know it's a favorite of DC stories to have things happen in stadiums, but I don't see anything immediately advantageous to aliens there. Maybe they're setting up a bigger thing with that Alien in the Hindu Kush... or Himalayas. Somewhere in that neck of the world anyway. There's a lot being setting up in this comic series, including a new totally not evil! boss in a media buy-out. Seriously, the amount of time he spends calling himself a good guy makes me seriously doubt his creds. I mean, we just need D. B. Woodside to play him and we'll be golden. It almost felt like this was a direct continuation of Action Comics #1 in its reference of the bad guy Superman picked up in those first pages: Glenmorgan. But he's little more than a random reference. (In fact, he isn't even going to be the biggest baddie we'll see in the entire run of Action Comics, being only the tail-end of the before arc of Clark's origin.) 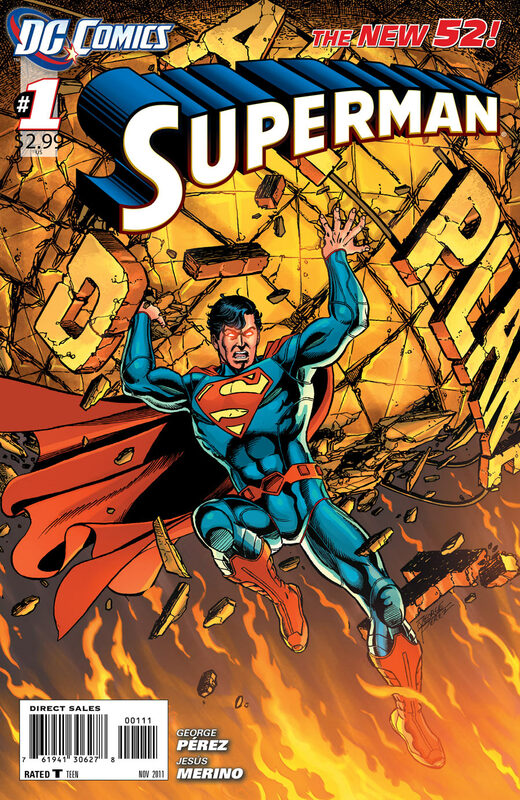 As I read elsewhere though, since Superman is much stronger and experienced in this comic, his adversaries here must raise the bar as well, creating a challenge for him, consequently a more interesting story for us to watch. In terms of mystery, that was easily achieved here, we know very little about the motivations and history of any of our baddies. 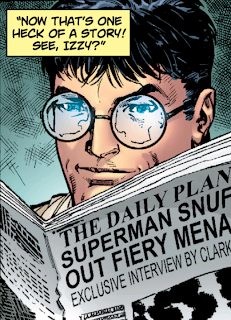 You know what else Clark Kent does? Get exclusive interviews with Superman. As I mentioned in the review of Action Comics #1, I fell in love with Metropolis and The Daily Planet in Superman: The Animated Series. 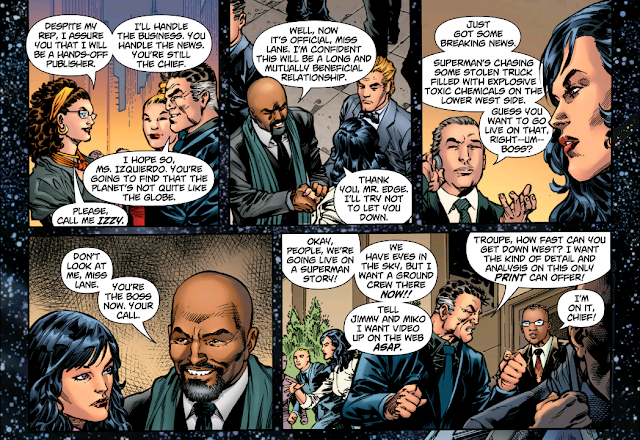 Once of the greatest moments of that series was when Clark Kent tells Lois Lane he's Superman and that's why he get's all the exclusives. But she doesn't believe him. To see that here, in it's own way, with Clark Kent's article overlaid on Superman's actions as the adventure is happening, was a trip of itself. And maybe this shows me off as the n00b I am, but it was my favorite part of this. I'm confused, Kent. See, I've lived in Metropolis most of my life and I can't figure out how some yokel from Smallville is suddenly getting every hot story in town. 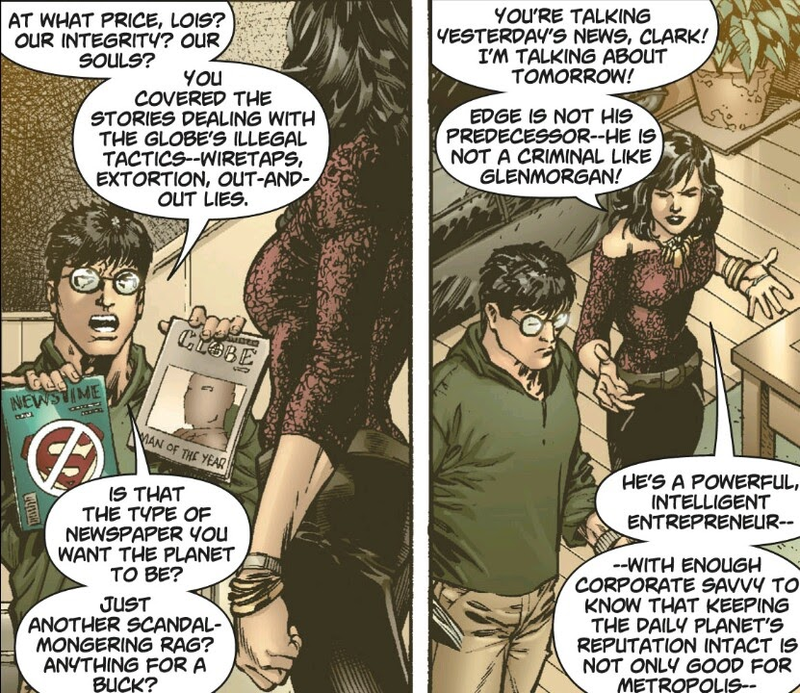 Well, Lois, the truth is, I'm actually Superman in disguise and I only pretend to be a journalist in order to hear about disasters as they happen, and then squeeze you out of the byline. You're a sick man, Kent. To see it in all its glory, click no further. *Not not literally, calm down. 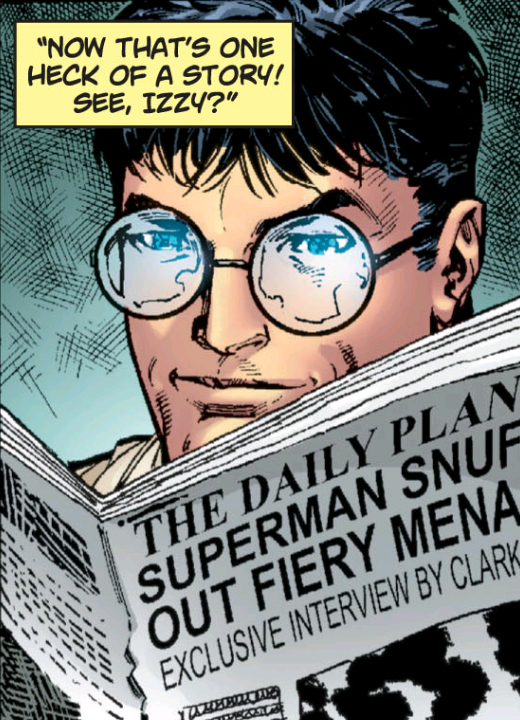 Bonus bad line: is Superman a worse writer than Clark Kent?? ?